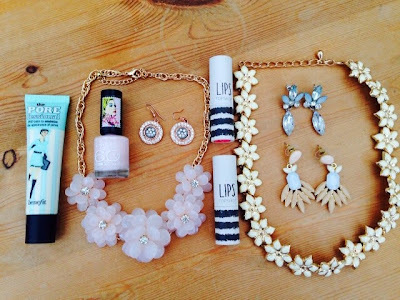 Hello there lovelies, today I wanted to share my March favourites with you all. I haven't bought too many beauty related products this month, but I did have a cheeky trip to Topshop's makeup counter recently and fell head over heels for their lipsticks! (I will come back to that!) I also have some fun pieces of jewellery that I have been obsessing over lately along with a couple of products I have mentioned previously. So let me get down to business and show you the things I have been loving this last month. 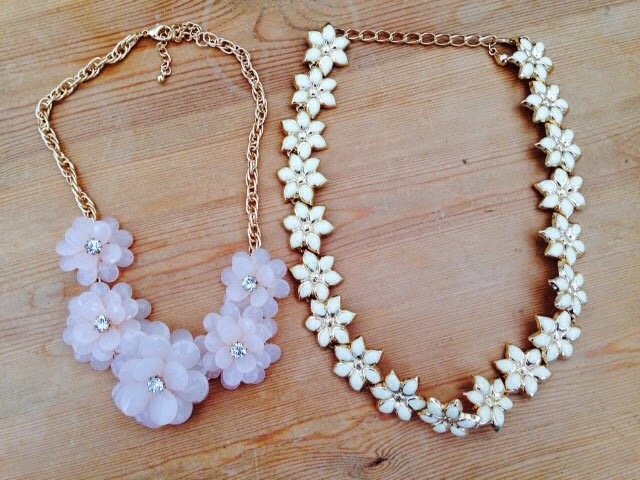 Okay, so I picked these necklaces up in New Look last month. I was looking for some pastel coloured jewellery that would tie in nicely with most 'spring looks.' I realise I don't often show my outfits of the day but I am thinking of making it a more regular feature on my blog...let me know what you think?! 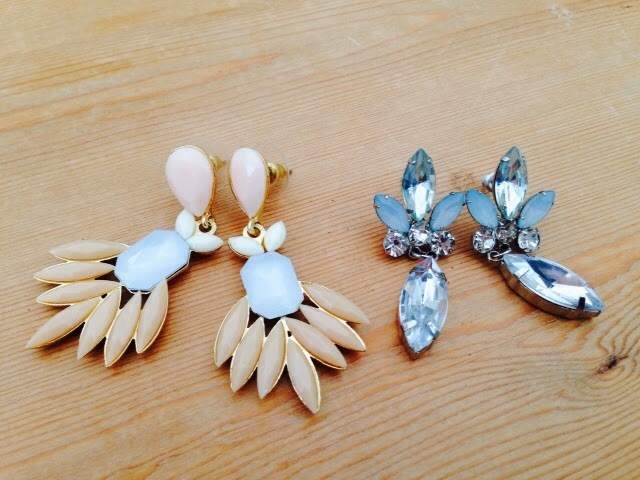 These two sets of earring drops were also purchased in New Look, seriously I have worn these over and over again the last few weeks. 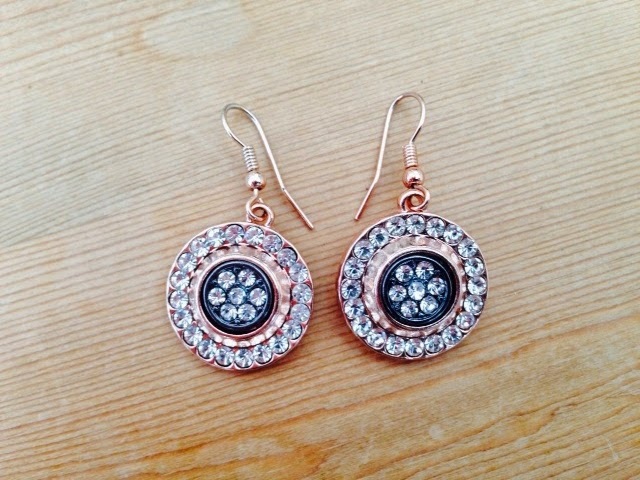 They pretty much go with any look be it casual day time wear, or a smarter evening look and they are so pretty and sparkly too! My mother-in-law gave these to me for my birthday last month, they're from Next and they are too cute! 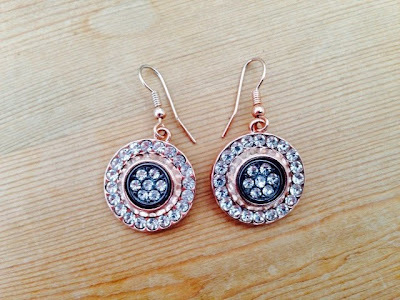 I love the rose-gold, it's so feminine and delicate and is a great colour on fair skin like mine! I've grouped these beauty products together because I didn't want to go overboard on the details as I have already blogged about two of them already! 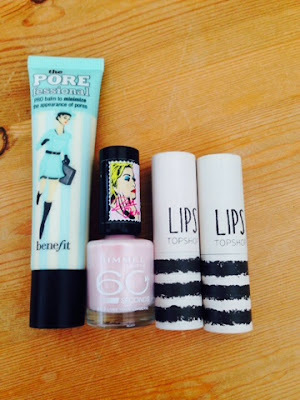 From left to right is Benefit's The Porefessional which is a silky soft primer. This makes such a difference to the staying power of my makeup and its application on my skin. If you haven't tried this, DO make sure to get a sample from the ladies at your local Benefit counter. Next is Rita Ora's nail polish for the Rimmel collection, this one is a beautiful pale pearlescent pink (nice alliteration there, haha!) which I have been wearing virtually non-stop the last few weeks....yeah, its bad! Finally, the two Topshop lipsticks are Macaroon, a really pretty bright pink and Petal, a less intense, paler and almost 'vintagy' pink. Topshop have a great range of colours and I was pleasantly surprised at the quality of packaging and consistency too. They're nice and creamy and smooth and best of all they don't have that horrible 'drying' feeling you sometimes get with some brands. 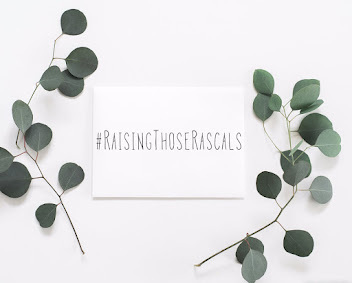 I must say I was dubious to begin with, I definitely prefer to stick with trusted makeup brands for my makeup and don't often trust brands that diversify to include makeup. I think it's something about knowing a company has specialised in, and has perfected a product for years that wins me over to them-hence my love for Estee Lauder! Call me stubborn folks...I probably am a bit! 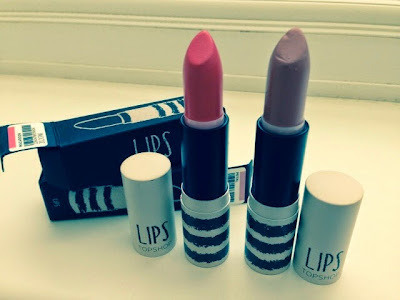 But I definitely would re-purchase from Topshop's lipstick collection again, I look forward to my next trip! So those are my favourites for March! I can't believe we are well into April now...this is madness! I hope you liked this post, let me know what you think about Topshop makeup, do you guys rate it?? ?